The software supports fast conversion of TGZ data to an EML file format. Convert complete data of TGZ file to Windows supported file format that is EML, the data include email, contact, task, calendar, attachments, etc. 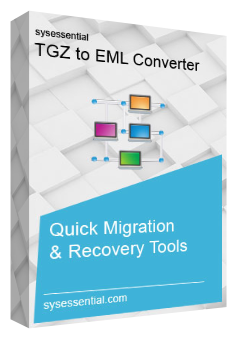 Any size of TGZ file can be uploaded in the tool for conversion of data to the EML file format. Convert data of TGZ file to EML format without any loss. Multiple files can be uploaded in the wizard to attempt the conversion. Meta information of email data remains intact even after the conversion is done. The meta information include attachments, date, time, To, CC, Bcc, Subject. TGZ file created on any version of Zimbra could be uploaded in the tool and data could be converted to EML format. The software is supportive to Windows OS and it can be installed on any machine carrying any Windows version OS. The software is the perfect tool to convert the data of Zimbra file created in any version of application to EML format without any loss. The entire data of TGZ could be viewed, accessed and read on EML. The sysessential for TGZ To EMLsoftware, after conversion of Zimbra files to EML format allow users to save file at the desired location and with the file name of desired choice. Users can support the upload of multiple TGZ file into the software to convert its data to EML format. The software works relatively faster, even with the multiple email upload option. The software could be installed on all the machines that has Windows OS, irrespective of what OS version is installed in Windows machine. The actual format of email data remains intact with new maileven after the conversion of data. The folder hierarchy, attachments and meta information everything remains in the same format, even after the conversion of data. EML is the open file format and it is supportive to many email clients. Therefore, once the TGZ data are converted to EML format, it can be accessed on many other mail clients, including Window Live Mail, Outlook Express, eM Client, Window Mail, Mac Mail, Thunderbird. The sysessential for TGZ To EMLsoftware has numbers of filter options, which allows selective conversion of data. The filter options could be checked and unchecked to attempt selective data migration. Users who want to check the efficiency of sysessential for TGZ To EMLsoftware can download the free version of the utility. The free utility allows users to convert 25 items from each folder. However, it has certain restrictions with regard to data conversion. Do I need to install EML supportive mail client in the system to attempt conversion? The sysessential for TGZ To EMLsoftwareis the standalone application and it does not require a supportive environment to do data conversion. How much time it takes to convert the TGZ data to EML format? The software has been developed by the best brains and thus, it has all the features to support fast conversion of data. Thus, the utility does not take much time to convert data even when more than one file is uploaded on it. However, to accomplish the fast data conversion, suitable license should be taken. Is there any limit to the TGZ file size to upload in the tool? No, there is not limit to the file, user can upload any size of TGZ file in the tool and the software will convert its data to EML format without any error or loss. How many TGZ files can I upload in the sysessential for TGZ To EML software at a time? The software allows user to upload any number and length of TGZ file and work flawlessly with it. Can I install software on multiple PCs after buying its license? The sysessential for TGZ To EMLutility is available with two types of licenses professional and home users. With the professional license the software could be installed on multiple systems, on the other hand, with the home license, the software can be installed on one two machines. However, more information with regards to same could be collected from the technical support team of Sysessential. The sysessential for TGZ To EMLwizard helped me a lot to convert my TGZ file data to EML format without any hiccup. It is an apt tool and the best thing about theutility is that, it is a standalone application, thus does not require any other software to convert data. I was looking for a tool to convert my TGZ file to EML format, and I downloaded one conversion utility from the internet, the software converted data to EML format, but not whole. I was very disappointed after its use, then got to know about Sysessential for TGZ To EML. I tried that and it helped me a lot. All my data got converted to EML format without any loss and trouble.